You never know what you might see at the Little A’Le’Inn. Area 51 is perhaps one of the most well-known top secret government facilities in the world. Aliens, UFOs, and conspiracy theories abound in this remote section of Nevada so it is only natural that the only road stretching through it is known as the Extraterrestrial Highway. 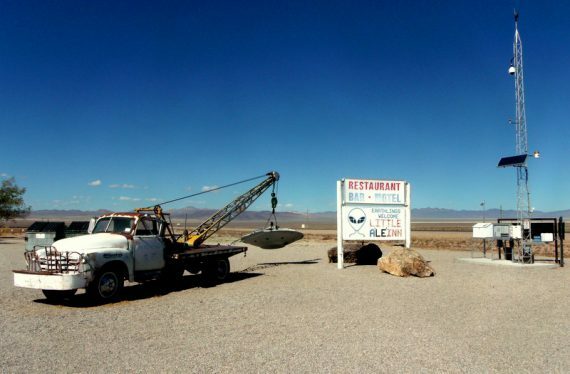 The Little A’Le’Inn in Rachel, Nevada is a Mecca for UFO enthusiasts and is a must see if you are traveling the Extraterrestrial Highway. But is there more to see along this lonely highway? Driving the Extraterrestrial Highway may be a bit of a different experience than many would expect. The vast majority of the 98.4 mile highway is open desert and open cattle ranges. The valley was originally farmland, and later home to a few mines, and is now settled mostly by ranchers. The Extraterrestrial Highway begins at the junction of the US 93 and Nevada State Route 375—the Extraterrestrial Highway—at Crystal Springs and heads westward. At the junction you can find some alien related sights, including the Alien Research Center and ET Fresh Jerky. The Black Mailbox has been a popular stopping point for UFO enthusiasts for years. The mailbox belonged to one of the nearby ranchers and has been removed due to vandalism. The spot of the mailbox can still be spotted along the highway as visitors still leave mementos there. The town of Rachel is quite small, and the only gas station has closed down some time ago. There are some interesting abandoned buildings around the town with some alien themed graffiti that is worth a look. Of course the main site to see is the aforementioned Little A’Le’Inn, a restaurant and motel decked out with UFO photos and merchandise. As you near the western edge of the Extraterrestrial Highway the landscape begins to change. About 44 miles west of Rachel, a small pond suddenly emerges next to the road. As far as I know it has no name, but this marks the beginning of a series of streams that bud up from the ground. You might spot these streams running parallel to the road the rest of the way. One of the streams leading to Warm Springs. 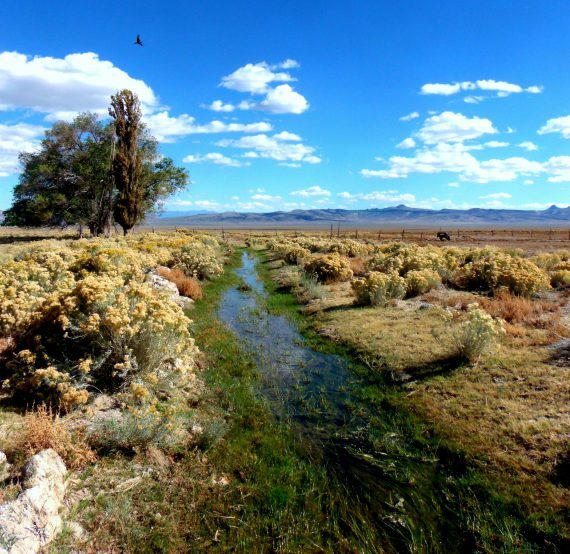 These streams inspired the name of the nearby ghost town of Warm Springs. Originally a stage coach stop dating to 1866, and eventually a gas station and restaurant, the natural springs were always the claim to fame. All of the businesses have long since closed shop, but the small pools of the warm mineral water and possibly some of the remains of the small huts that used to be rented by travelers looking for a reprieve can still be found there. The ghost town of Warm Springs marks the end of the official route, but you can continue westward on Highway 6 to Tonopah. Along this stretch there is another aeronautical landmark—the marker for the Tonopah Test Range, also officially known as Area 52. The Tonopah Test Range’s official website explains that “Tonopah is the testing range of choice for all national security missions. Tonopah Test Range (TTR) provides research and development test support for the Department of Energy’s weapon programs. The range also offers a unique test environment for use by other Government agencies and their contractors.” However, many conspiracy theorists believe there is much more going on there. According to these theories, there is a massive underground network capable of housing up to 25,000 people beneath base. The landing strips to enter the base emerge from the ground as the desert opens like a zipper, aliens and secret weapons and whatnot are all to be found inside. 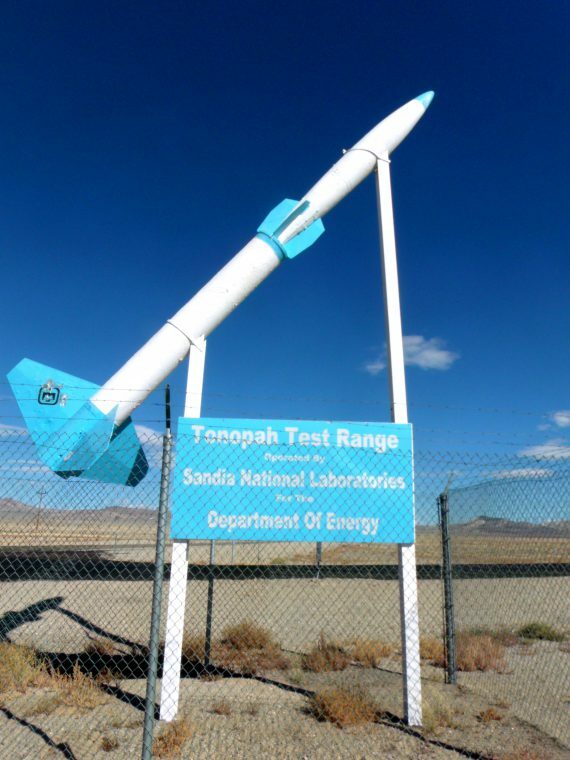 The Tonopah Test Range does have a verifiable interesting history even without the conspiracies. It was built in 1957 and was used for testing many of the Air Forces most groundbreaking aircraft over the years. From 1979-1988 a covert operation known as “Constant Peg” was carried out to test the abilities of captured Soviet MiGs. In the early 1980s F-117 Nighthawks were first tested at the Tonopah Test Range as well. If you decide to drive the famous Extraterrestrial Highway, be sure to come prepared. Have plenty of water and snacks, season appropriate attire, and be sure to fill up in Alamo, Nevada because the next gas station is in Tonopah. As always, roadtripamerica.com is the perfect tool for planning such excursions! Looks like something to do for a drive out of Vegas. Very interesting facts too.